Planet Earth T Shirt: Nightshade edition. 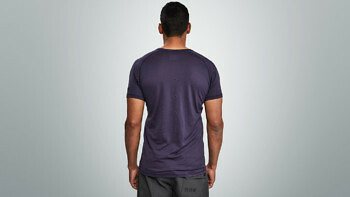 The Merino t shirt designed to work from the poles to the equator. We experiment with some of the most advanced materials on Earth, but sometimes millions of years of evolution has done the job for you. Merino sheep are bred to survive scorching summers and freezing winters, so their fleece has evolved to help them stay cool in temperatures of over 30°C, while staying warm in -10°C. So when you wear Merino fibres they respond and adapt to the conditions you find yourself in – either trapping or releasing heat depending on the temperature and humidity of your skin. Built from an ultra-fine and responsibly sourced Merino, this t shirt can be worn on its own or as part of our Planet Earth Merino system. It’s high wicking, breathable, odour resistant, highly elastic, and keeps you insulated even when wet. We shot the Planet Earth T Shirt on former NFL Linebacker Donnie Edwards who now paddleboards with sharks. Donnie is 6ft 3 and wearing size XL. 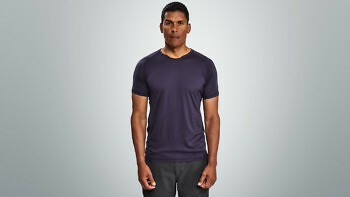 The t shirt is a slim fit and can be worn with the Planet Earth Baselayer or Planet Earth Hoodie. If you’ve already got our Condition Black Ceramic T Shirt you’ll find this has a similar fit. To build a t shirt that can work anywhere on Earth you need to start with an exceptional material, so we built ours from an ultra-fine Australian Merino. 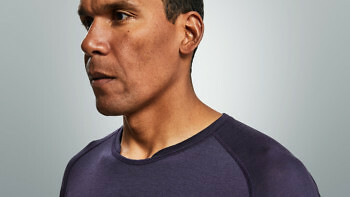 The t shirt is part of our Planet Earth Merino system – a hoodie, baselayer and t shirt built from Merino blends that are designed to work together. With the t shirt under the hoodie, you’ll have Merino next to your skin, and Merino exposed to the elements, but with an ultra-soft layer of fleece from the underside of the hoodie trapped in between for extra warmth. Staying warm is all about trapping as many pockets of air next to your body as possible and that’s what Merino is built for. Every Merino fibre is hollow which means you have millions of air pockets trapped next to your skin. And as the natural curl of wool fibres traps more air than straight fibres, the microscopic texture of the fabric itself will also retain heat. The t shirt’s engineering comes into its own in cold terrain. It’s soft, stretchy and high wicking so you can wear it on its own if you’re looking to go fast and light. 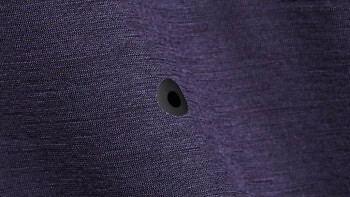 The outside of every Merino fibre is covered in a natural wax coating which makes it water repellent when you’re outside. At the same time the Merino acts like a sponge to soak up sweat and spread it over a massive surface area so that it evaporates at high speed. And as Merino can absorb over 30% of its own weight in water and still feel dry, you’ll stay warm and insulated. 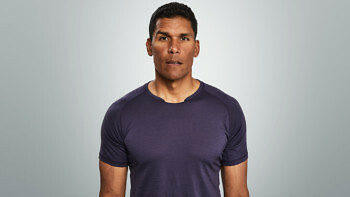 Merino also stops you overheating in higher temperatures as it simply releases its warmth if you’re getting too hot. Merino wool has to keep sheep cool even when the temperature goes over 30°C, so the Merino fibre naturally absorbs the moisture from sweat and disperses it to start releasing heat. On the back of the t shirt we've added 6 welded vents. We built our fabric from scratch in Italy with one of the softest substances in the world. These same Merino fibres are naturally elastic which means the Planet Earth T Shirt will stretch with you whatever you’re doing. They can also be pulled with a lot of sudden force without breaking and still return to their original shape. It’s not sweat that smells, or even the clothes themselves, it’s the build-up of bacteria on the surface of the clothes. Merino is naturally odour resistant – odour molecules are absorbed and locked into the centre of the fibre of the Merino so you simply can’t smell them. They’re then released when you wash the hoodie. Flocks of Merino sheep have been kept for their wool ever since the 12th century. Bred by the Spanish royal family they were so highly prized that taking one out of the country would have you killed. And when the first 26 sheep from the royal flock sailed to Australia in 1797, even the ship’s crew gave up their cabins so the sheep could have them. While half the sheep died on the crossing, the rest became the start of a breeding line that would go on to dominate modern Merino production. While Merino is an amazing material it has to be made ethically and in the right way. All of our Merino is certified by the Responsible Wool Standard, an independent body in Australia set up for farms committed to protecting the welfare of their sheep as well as the land they graze on. It means we can trace the journey of the Merino from these farms in Australia, to the spinning of the yarn in Italy, through to production of the hoodies in Portugal. The fabric is also Blue Sign approved, which means it was made with minimal impact to the environment.